A school described by parents as a ‘North Korean gulag’ for making pupils walk silently between lessons has now hired lawyers to threaten a mother with legal action over a series of Facebook posts. 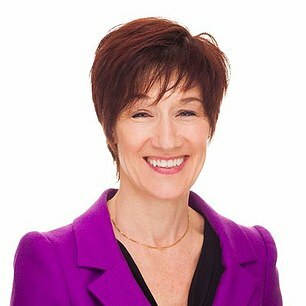 Susan Hunter, whose 15-year-old son Cameron attends the Birmingham school, received a letter from solicitors Irwin Mitchell insisting she take down posts criticising the school’s policy and its CEO Catherine Anwar – and that she apologise to all her followers in words ‘to be agreed with the school’. 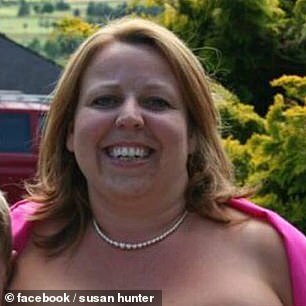 The lawyers for Ninestiles Academy claim Ms Hunter, 44, has has defamed the Academy – although in places they seem to have misunderstood her posts, The Sun reported. Ms Hunter told the paper: ‘It’s totally bizarre. ‘They are trying to silence me because I care and speak to other parents. She said after a meeting with school bosses she received this letter just before Christmas, adding: ‘I wasn’t very impressed. ‘My Facebook is shut down and is private. And the Anti-Academies Alliance group on Facebook is a closed group so they must have searched for the comment. She explained her older child had already gone through the school, and she had been impressed with the teaching, but under a new CEO who came in 18 months ago a string of teachers had resigned and new rules have upset many parents. In their letter, the academy’s lawyers mention her criticism of the silent corridors policy and list her allegedly defamatory statements. The lawyers incorrectly claimed Ms Hunter was referring to ‘kids’ from Ninestiles having called Childline, The Sun reported. The lawyers also refer to an email from Ms Hunter in which she again claims to have been threatened by Ms Anwar and that the trust boss has ‘bullied’ pupils at the school with her policies. The letter threatening legal proceedings also claims to have linked a Mumsnet article to Ms Hunter due to the account name ‘Sus28’ and statements being similar to others made by the mum-of-two. They included claims she had been threatened by Ms Anwar, that the school was preventing staff speaking out about problems, and allegations against unnamed members of staff. Lawyers claimed Ms Hunter had defamed the school and also Ms Anwar with her statements. They highlighted the number of people she had sent her email to and that she had ‘over 100 Facebook followers’. In a section headed ‘action required by you’ the lawyers tell Ms Hunter they want her to agree to remove the posts, publish an apology on her social media account with wording agreed by the school, and promise not to repeat her allegations. In October the school hit the headlines for its draconian ‘zero talking in the corridors’ policy, which one parent described as being like a ‘North Korean gulag’. Those caught talking face being punished with a 20-minute detention. The silent corridors policy came into effect after the half term break but parents were furious. One father told The Sun last year:’Parents are dead against this “silent corridors” cobblers. It’s oppressive and utterly unnecessary. ‘Children are supposed to talk and school is supposed to encourage social skills as well as teaching them facts. ‘Why does the school want to teach children to be mute zombies? Last month it emerged the school had been forced to hire a security guard after teachers were knocked to the ground and kicked when they tried to protect a student being attacked by a group of people. Ninestiles hired the guard after the fight outside the school gates on November 26. A pupil and two staff members suffered minor injuries, prompting the school to add extra security. 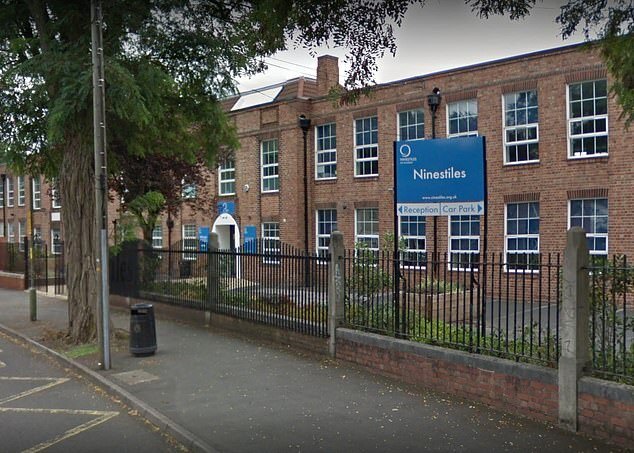 A spokesman for Ninestiles said today: ‘We have met with this parent on two occasions as well as speaking to her by phone and exchanging emails. ‘Despite our willingness to engage with her, she continues to express views publicly that are both untrue and damaging. ‘The letter was sent by our lawyers after a good deal of consideration but we cannot allow damaging claims to jeopardise the reputation of the school and our professional staff.